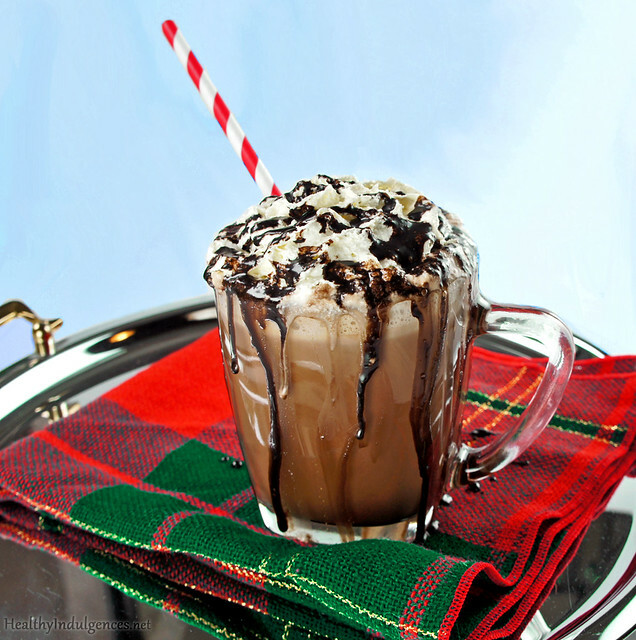 -You can whip up this peppermint mocha creamer in a few minutes on the stove top, or you can let it do its thing in a crock pot. You literally wait for the chocolate to melt, and you’re finished! -The consistency of this creamer is best when you use a stick blender or an actual blender to smooth it out. You only need to blend it up once. -To make this recipe paleo and dairy-free, use 1/2 full fat coconut milk, and 1/2 cashew milk. I blend 1 cup cashews per 2 cups of water in the Vitamix to make an extra thick cashew milk to use in coffee. Coconut sugar and stevia would be paleo-friendly sweeteners to use. Because I try to avoid sugar, the recipes on this blog have not been tested with paleo sweeteners. -Remember that when you are working with chocolate, you must combine multiple sugar-free sweeteners to get the best results. That’s a really important tip! In the first batch, I used 1/4 cup Splenda + 6 Tablespoons of Truvia. In the second batch, I used 6 Tablespoons erythritol + 1/2 teaspoon stevia. In the final attempt, I used 1/2 cup Swerve + 1/2 teaspoon pure stevia extract. Swerve and stevia are all natural and calorie-free, so go that route if you’re trying to avoid sugar and artificial sweeteners. All of the sweetener combinations worked well. It’s a challenge to cater to everyone who reads this blog (low carbers, diabetics, the paleo crowd, the “all natural” eaters), so I like to give you all options. You can use whichever sweeteners fit your lifestyle and dietary preferences. 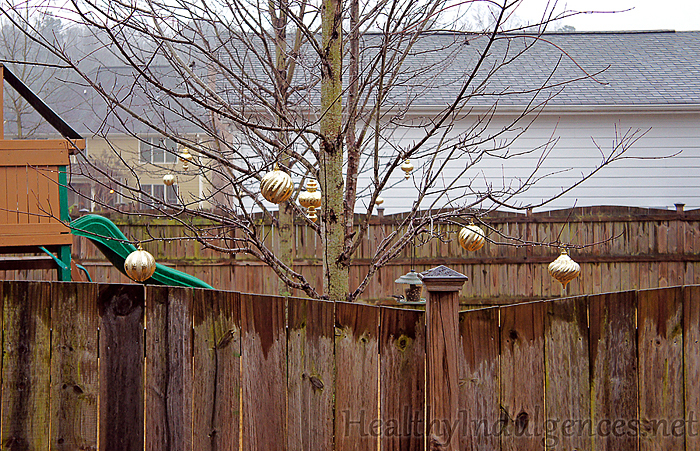 -Store your homemade mocha creamer in the fridge. A glass pitcher like this one is the perfect storage vessel for your homemade flavored syrups. Money-saving tip: I found a similar pitcher at Wal-Mart for $4! -Lindt 85% chocolate bars do contain some sugar. You can try using unsweetened chocolate in this recipe if you are following a totally sugar-free diet. 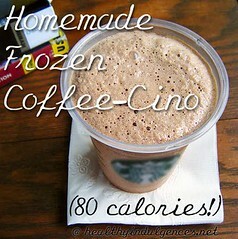 I have not tried the recipe with unsweetened chocolate, so please share your results if you do. 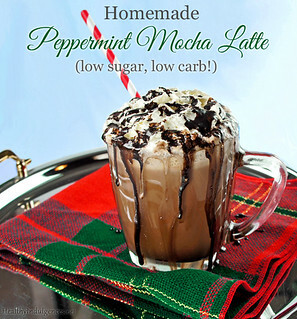 A homemade syrup that you can use to make Peppermint Mocha Lattes in seconds! You can use whichever sweeteners you like. Just be sure to make this concentrated syrup a bit sweeter than you want your drink to be. The mix is enough for 8 lattes. hand blender or (carefully!) a regular blender to blend mixture until smooth. Pour syrup into a glass storage container and refrigerate before using. 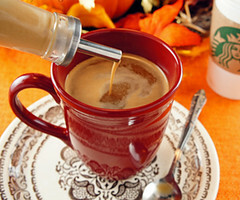 To make a single mocha latte, add 1/3 cup (79 mL) of syrup to 1/2 cup (118 mL) black coffee. *For the most authentic Starbucks taste, use a Dutch processed cocoa powder like Droste brand. I get mine at World Market. You can also order it at iherb. **It was challenging to sweeten this recipe using 100% sugar-free sweeteners. In the first batch, I used 6 Tablespoons erythritol + 1/2 teaspoon stevia. In the second batch, I used 1/4 cup Splenda + 6 Tablespoons Truvia. In the final attempt, I used 1/2 cup Swerve and 1/2 teaspoon NOW Better Stevia extract. Swerve and stevia are all natural and calorie-free, so go that route if you’re trying to avoid sugar and artificial sweeteners. To find out more about why I combine multiple sugar-free sweeteners, check out the Healthy Indulgences Cookbook. Did someone really imply that electing a Democratic congress has caused these problems? The ground work was set long before the 2006 midterm election. Remember, the brilliant Bush never vetoed one time until the Dems took over Congress. Now he vetoes anything that does not favor big oil and the military complex monster. aFoEg0 Some truly quality articles on this site, saved to bookmarks.